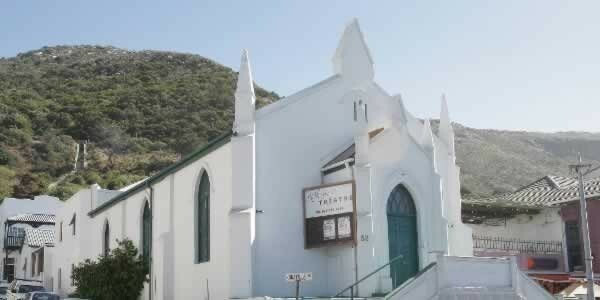 Kalk Bay Theatre is a 78-seater theatre situated in the old Kalk Bay Dutch Reformed Church. Built in 1876, it is a heritage protected building which has been lovingly converted into an intimate theatre with a bar area serving dinner and drinks on the upper floor. 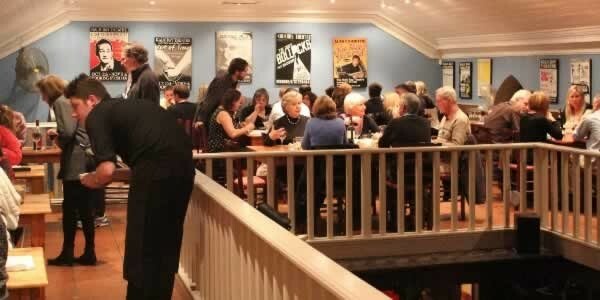 Kalk Bay Theatre offers a unique and elegant but relaxed evening of top-class dinner and theatre. Patrons can linger after the show to enjoy coffee and dessert and meet the performers. Doors open at 18h30, with dinner served from 19h00. Pre-reserved seating is included in the dinner booking deposit, otherwise seating is unreserved. After reserving their theatre seats, guests are directed upstairs where they can enjoy a drink. The menu is vegetarian friendly and other specific dietary requirements will, wherever possible, be catered for provided advance warning is given. Kalk Bay Theatre is licensed and corkage is charged at R30 per bottle. Patrons make their way down to the theatre when the show is due to start � drinks may be taken into the theatre but there is no service in the theatre during the show. The 78 spacious theatre seats crafted out of beech wood and modelled around the comfortable Morris chair. The theatre is a thrust stage with the audience on three sides, making for a very intimate theatrical experience. The Kalk Bay Theatre caters for special occasions, birthdays, office parties, corporate functions and tour groups. Parking is available in the municipal parking area just before the Theatre (coming from Muizenburg side, just after the Theatre coming from Fish Hoek side). Main Road Kalk Bay is currently a 2-way system, but there is a stop/go system at the harbour end of the road, so it may be best to allow a little extra time to get to us. Address: 52 Main Rd, Kalk Bay.